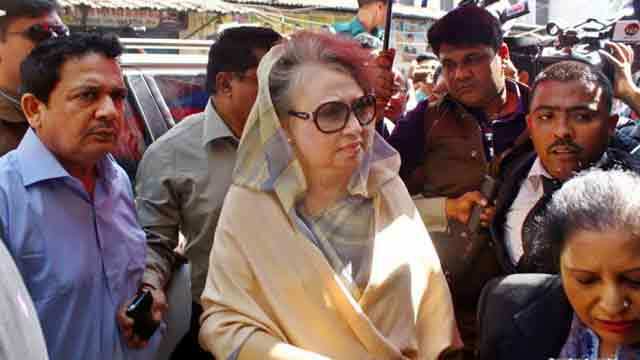 Dhaka, Dec 4 (Just News): BNP Chairperson Begum Khaleda Zia will appear tomorrow before a makeshift court in Dhaka’s Bakshibazar to seek bail in connection with Zia Orphanage Trust and Zia Charitable Trust graft cases. “She will appear before the court around 11:00am tomorrow,” advocate Sanaullah Mia, one of Khaleda Zia’s lawyers, told today. Tomorrow, the court will hear arguments in Zia Orphanage Trust corruption case while Khaleda will place her self-defence statements in Zia Charitable Trust corruption case. Earlier on November 30, the same court issued arrest warrant against Khaleda, a former prime minister, after cancelling her ad-interim bail as she failed to appear before it in time. On October 19, the makeshift court in Bakshibazar granted the BNP chief the ad-interim bail after she surrendered before it and sought bail. On August 8, 2011, the Anti-Corruption Commission (ACC) filed the Zia Charitable Trust graft case with Tejgaon Police Station, against four, including Khaleda Zia, of raising funds for the trust from unknown sources through abuse of power.